I usually don’t do photo essays on a single subject. 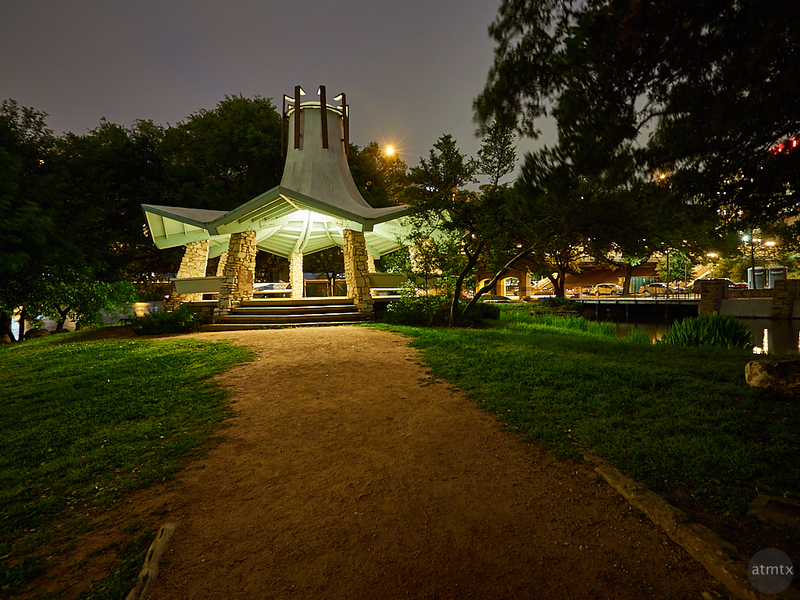 But I was oddly obsessed with this pavilion, that I discovered in a park, across from the downtown Austin skyline. As with the last two posts, I was with my photography friends, shooting the popular spots in Austin. I wanted to find something different. While my friends were busy shooting the skyline, I was looking for new angles. 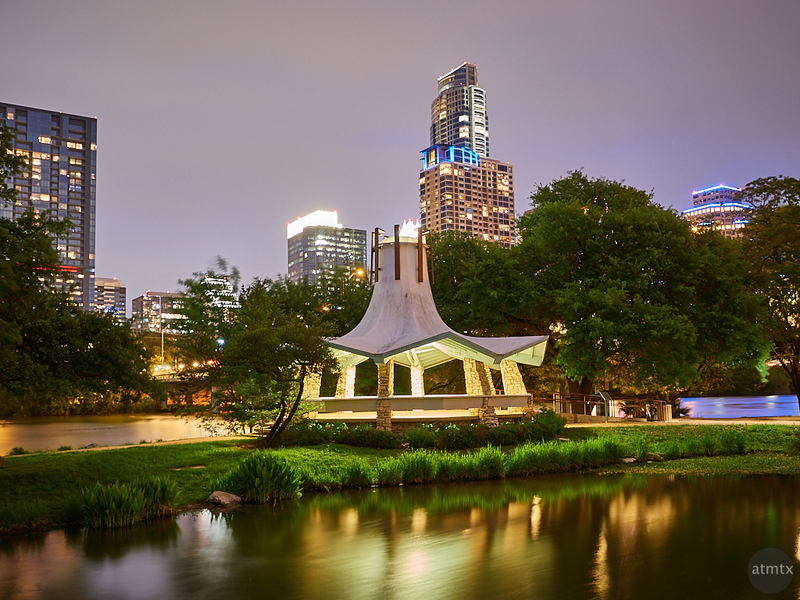 This pavilion, located in Auditorium Shores, looks vaguely Asian and has a mid-century modern sensibility. I did some research but couldn’t find any details on it. Its once modern styling looks like something from the 50s or 60s. It clearly looks like a remnant from the past, when Austin was a smaller and more modest city. I was originally looking to use this structure as a foreground to the skyline. Unfortunately, the trees obscure more of the buildings than I like. What may be instructive about this post is how I explore a subject, particularly if I can’t get the composition that I want. I usually look around for alternate angles. Below are five more photos I created of the same subject, the mysterious pavilion, each with a different point of view. 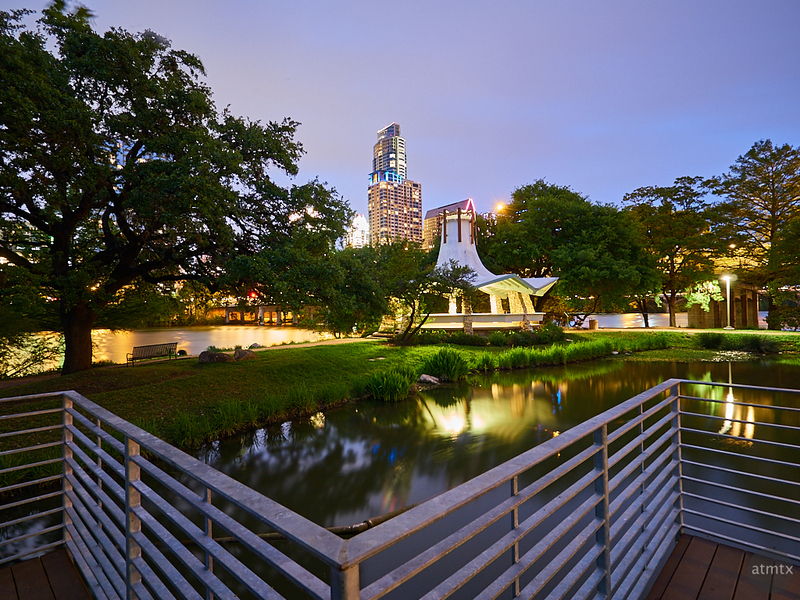 Recently, Austin renovated this area with a new deck that floats above the reflecting pond. I like the zig zag of the new railing as a foreground detail. Unfortunately, even more of the skyline is obscured by a large tree. I then turned my attention to the pavilion itself. 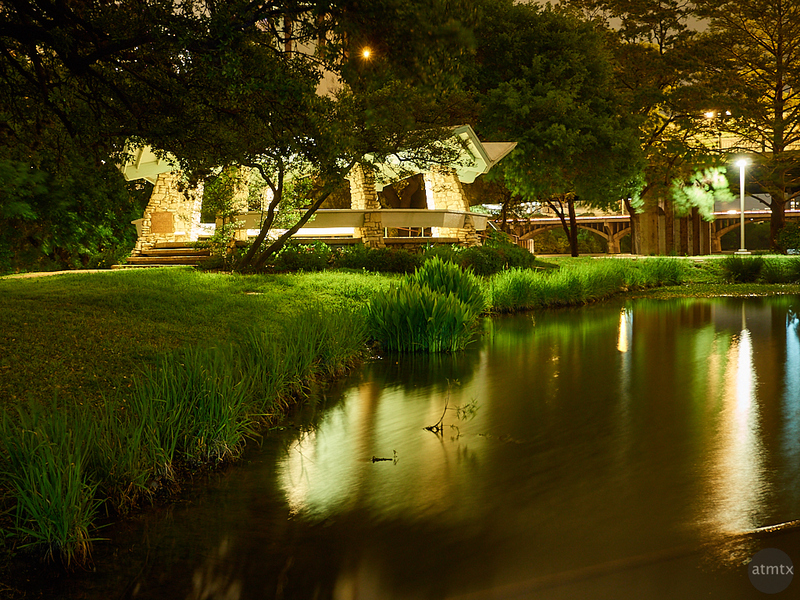 I was attracted by the glow of the lights and how it highlights the surrounding greenery. The first view is the approach from the west. With the dirt path and ample plant life, it looks like it’s sitting in the middle of a park. The view from east looks completely different. The handrails and ramp acts as a graphic leading line, pointing directly at the structure. It reminds me of a lightly reworked flying saucer, hidden in plain sight. As it happens in “Men in Black”, with the proper alien launch codes, this long dormant object may magically transform back into a space capable craft. Ultimately, I was most attracted to the glow of the grass surrounding the pavilion, along with the reflecting pond, with the angular roof acting as a counterpoint to the organic shapes of nature. I zoomed in fully with the wide-angle, which only went to a 36mm equivalent. To get the composition I wanted, I cropped further in post. The last image pulls backs again to show the relationship to the city. It’s similar to the first image but from a slightly different angle and composition. And while I’m all for trees, I couldn’t help but think, photographically, how much better this photo could have been without them blocking the downtown view. 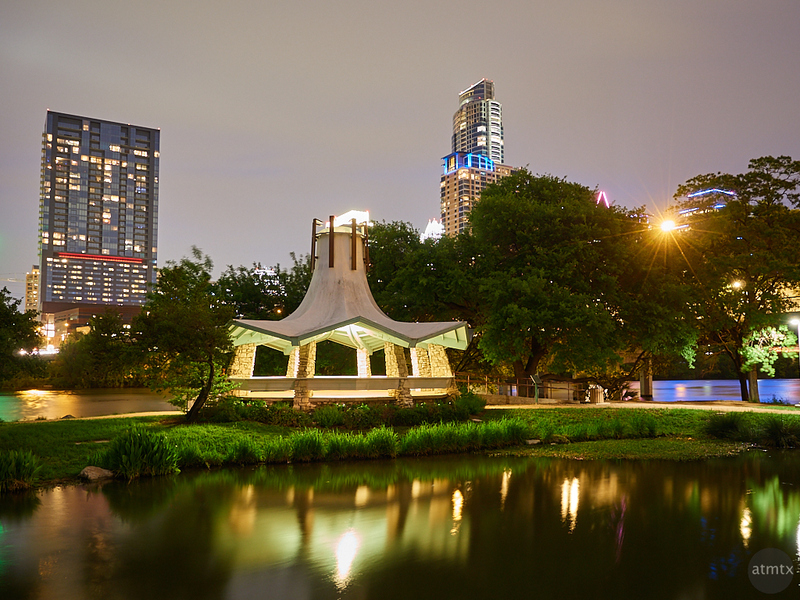 The reflecting pond, the glowing grass and the pavilion in the foreground would nicely enhance our modern and growing skyline. That said, photography is about creativity and by shooting multiple views, I think I got something unexpectedly interesting. I would have never considered the closeups of the building and the accompanying glow of the surrounding grass as my favorite part of these images. Update: Thanks to blog follower, Michael Flores, for linking to an eBook (below) that gives a history of this structure. It’s called the Fannie Davis Gazebo. Designed in the late 60s and was opened to the public in 1970. Looking through the historic photos on the eBook, three things struck me. One, the original design did have an open view to the skyline, without any trees getting in the way. Two, 1970s Austin didn’t have much of a skyline. Three, the original surrounding landscape had an optimistic and modern “World’s Fair” feel to it. The eBook chronicles it’s construction, and the various attempts to save and renovate the gazebo. It’s an interesting story. Thank you for sharing! I find myself looking for new perspectives and scenes when everyone else is focused on the same subject. I found this interesting e-book on the gazebo, https://issuu.com/cadame/docs/gazebopages with various articles and pictures. As usual I appreciate the details and images! Michael, thank you for the link to the eBook. I’ve updated the post with some more details. The gazebo was dedicated to my great great Aunt in the 80’s. 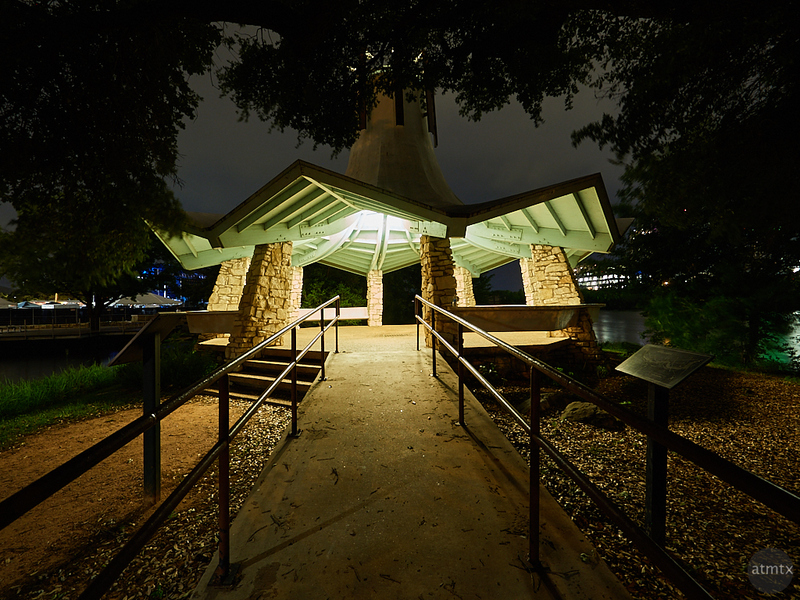 It used to be the focal point of Town Lake at the time. I have a pencil drawing of the gazebo on my living room wall and would love to see about getting copies of the wonderful pictures you have taken of it. Paula, that’s neat. I’m surprised that you even found my blog post. I can send you the photos. Is your yahoo email account you posted under, OK to use, for sending you the photos? Yes that is my email account. Your pictures are really wonderful. Thanks, Paula. I’ll send them to you. I should have told you that a friend actually sent me the link on facebook about taking them. I was just curious. It’s a small world isn’t it?